Have you ever wondered what would Children Of Bodom look like without Janne Warman? I mean, sure, Wildchild Laiho is a master guitarist/songwriter/screamer and everything else, but my opinion is that Janne’s unmistakable trademark keyboard playing style matches to perfection the lightning-fast and aggressive pace set by the guitar and rhythm section, adding his personal touch to the overall unique sound of the band. Aside from his significant contribution to the COB fame, Jane decided back in 2000 to pursue other metallic sound avenues, together with his brother guitarist Antti Warman, hence the Warmen group. 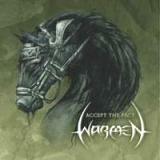 The third installment in the Warmen history is the 2005 Accept The Fact opus. With fellow countrymen Lauri Porra on bass and Mirka Rantanen on drums, and having no less than four guest vocalists, the album displays a variety of styles. From the opening instrumental Accept The Fact, with its creative furious keyboard attack, through classic northern European melodic speed/power metal tunes like Puppet or Waters Of Lethe and up to straight old school heavy metal (Lying Delilah), the band shows its talent and the capability to play within different genres. As all COB or Warmen fans should expect, we are treated with a few instrumental tracks on the album (three of them), beginning with the title song, keyboard driven, with excellent rhythm section at full speed and with brother Antti keeping up the pace with dual harmonies; midway through the album we have Ropongi Rumble with good guitar leads, totally shredding keyboard lines and finally the best of the instrumentals Return Of Salieri, with its European XVIII century flavor, with the harpsichord sounding keys, super fast rhythm, again excellent mix of guitar leads and keyboard hooks, a good bass solo and strong up tempo ending. The first singer on the album is Stratovarius’ Timo Kotipelto, appearing on two tracks. The first, Invisible Power is sounding a little bit too much like a Stratovarian composition (keyboard driven though), as much as I would like Timo’s emotional voice on it. The second, Puppet is much better, with a heavier sound, mid paced, with excellent alternation between guitar (one of the best performances of Antti Warman on the album) and keyboard solo. Marko Waara of Tunnelvision is the next singer, also on two songs. First of them is the third track, Waters Of Lethe, a melodic song, guitar oriented, with good vocal performance, Waara’s voice clear and open over a full sound; second, is the classic sounding heavy tune Lying Delilah, slow paced with a heavy sound based on crunchy guitar riff, background synth sound in the vein of early Dio or old Black Sabbath. One of the nice surprises of the album comes from Jonna Kosonen (Nylon Beat), a very good singer with a soul based timbre, on one of the best songs on the album, They All Blame Me. A tune with great atmosphere, quiet intro building into a mid tempo guitar lead song, supporting Jonna’s powerful voice. On all mentioned songs, Janne takes a step back, allowing the band to show strong musicianship, and create a more complex sound based not just on keyboard leads. Last song of the album is a cover of Rockwell’s classic Somebody’s Watching Me; I’ve never been a huge fan of covers, maybe because I’ve seen too many classics mauled by over ambitious performers, fortunately this is not the case. Featuring Alexi Laiho’s mean voice, along with the very good rhythmic beat makes this a very nice addition to the album. This is a solid metal album. My only complaint is about the fact that sometimes you can’t feel that the songs are being played by the same band. Maybe it’s the varied styles, or the various singers; fact is that sometimes is difficult to put your finger on the soul of the band. Fans of the previous Warmen albums, Unknown Soldier (2000) and Beyond Abilities (2001) might not be satisfied with the overall performance of the album but I think the quartet shows that they are more comfortable playing together, experimenting with different sounds and styles. Recommended for heavy metal/progressive power fans out there.